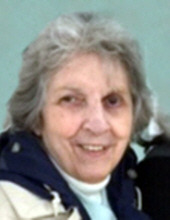 Rosella H. Richetelli, 89, of Hamden, formerly of New Haven, loving wife of Nicholas Richetelli, peacefully passed away at home on January 18, 2019. She was born in New Haven on December 16, 1929 to the late Gus and Rosella Kellogg Boyaji. Along with her husband, she is survived by her children Ronald Richetelli and his wife Dona of Clinton and Rosella McLean and her husband John of North Haven. Rosella also leaves her loving grandchildren, Robert McLean, Rachel Fasano and her husband Rudy, Ryan Richetelli and his wife Ali, Kevin Richetelli, Megan Shapiro and her husband Kris, and great-grandchildren Faith Fasano and Ella Richetelli. She is predeceased by her sister Flora Boyaji and brother Charles Boyaji. Friends may visit with Rosella’s family on Tuesday, January 22 from 10:00-11:00am at Beecher & Bennett Funeral Home, Hamden. A service celebrating her life will be held at 11:00am. Entombment will follow in All Saints Mausoleum, North Haven. In lieu of flowers, donations in her name may be made to the Boston Children’s Hospital Trust, 401 Park Dr. Suite 602, Boston, MA 02215. "Email Address" would like to share the life celebration of Rosella H. Richetelli. Click on the "link" to go to share a favorite memory or leave a condolence message for the family.